The new PT-RZ470 and PT-RZ370 series projectors from Panasonic have replaced the current short-life span expensive conventional lamp systems with a combination LED and laser diodes. The new light sources claim to have a life-span of 20,000 hours – that's around 5 times more than a normal bulb-based projectors life-span - and offer long lasting high brightness of more than 3,000 lm. The PT-RZ470 and PT-RZ370 Series will be offered in two different resolutions, 1080p (1920 x 1080) and WXGA (1,280 x 800). Both projector series are equipped with Panasonic's proprietary Daylight View technology, where a built in ambient light sensor helps maintain the image quality in changing environmental conditions. 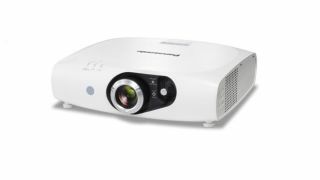 Additionally Panasonic have also announced another world's first, with the world's first high-brightness compact LCD projector with digital link, the PT-VW431D which allows the projector to be placed up to 100 metres away from the input source. The Panasonic Digital Link technology, is based on Valens HDBaseT technology, and is built into the PT-VW431D for easy and simple digital connection of HDMI, other full uncompressed HD videos, audio and control commands all via a single Cat5e/6 LAN cable. The PT-VW431D offers high brightness of 4,300 lumens and a high contrast ratio of 3,500:1 and also includes Panasonic's Daylight View Basic technology. The PT-VW431D can be either portable or ceiling mounted and the 1.6x manual zoom lens allows wide range projection from 2.5m (8.2ft) to 4.1m (13.5ft). The PT-RZ470 and PT-RZ370 Series will be available through authorised Panasonic resellers starting from 2012 Q4 and 2013 Q1 and the PT-VW431D will be available in October 2012.